To help take advantage of this, I’ve updated my vcd-h5-themes module on Github to understand the new capabilities in vCloud Director v9.7 (API version 32.0) to allow easier manipulation of the portal branding configuration options. In particular the ‘Set-Branding’ cmdlet can now take a PSObject parameter with the customization links to be overridden or added to the portal (more about what this means later), it will also now take an optional parameter to limit the scope to a single vCD tenant organization (rather than applying changes to the system-default branding). The ‘Get-Branding’ cmdlet has also been updated and can now retrieve either the global default branding, or the branding from a specific tenant organization. 2) The menu under the current username (highlighted in red above) can be extended with any number of new sections, separators and links to other pages. The way these are performed is slightly different, but both are placed into the customLinks object passed to Set-Branding. – The ‘About’ link under the ? 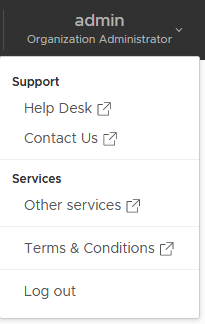 icon should redirect to our company about page at https://my.company.com/about/ instead of the default VMware ‘About’ page. The syntax is a bit fiddly here – in particular make sure that you place quote marks around each value as shown above – it may be easier to copy this script and edit the values rather than creating from scratch. You can also use the ‘-Tenant’ switch to apply the changes to a specific tenant organization only. Even better, VMware has released a toolkit to allow Service Providers to fully customise the look and feel of the portal using CSS themes in their Clarity framework.. The toolkit itself is part of the VMware vcd-ext-sdk repository on github, available in the /ui/theme-generator folder. The repository has good instructions on how to modify and build a custom theme, but actually uploading and configuring the theme in vCloud Director is only accessible via the vCD API and involves a reasonable amount of manual work. To help speed up development and allow changes to be easily tested, in my usual mode I’ve written a small PowerShell module that allows quicker/easier theme configuration. The module is available on github at https://github.com/jondwaite/vcd-h5-themes. Hopefully this will help those of you who need to develop and test updated themes for your vCloud Director portals. I’ve included documentation in the repository on each cmdlet, its function and arguments here. To use the module you’ll need to be connected to a vCloud instance as a user with global ‘Administrator’ access in the ‘System’ organization since changes will affect all portal users. You’ll need to be connected to the vCD environment with PowerCLI (Connect-CIServer…) prior to using the cmdlets. You can then download the vcd-ht-themes.psm1 file and add it to your session (‘Import-Module vcd-h5-themes.psm1’) to access the cmdlets. As always, comments and feedback welcome – is there anything else you’d like to see added to this module? Bit of a quick post this, but hopefully useful to others. 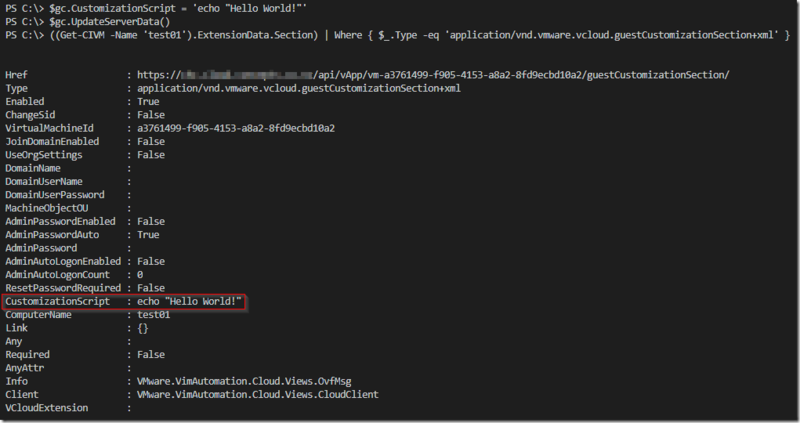 I got asked recently if there was an easy way to set Guest Customization options for VMs hosted in vCloud Director via Powershell/PowerCLI. It turns out there is an extremely simple way, but the syntax is a bit awkward so figured it would make a good/quick blog post. You can change other settings using the same method (e.g. ComputerName or Domain join settings). Note that for many changes the VM must be powered off, and you may need to ‘Power On and Force Recustomization’ too. As always, comments & feedback appreciated. 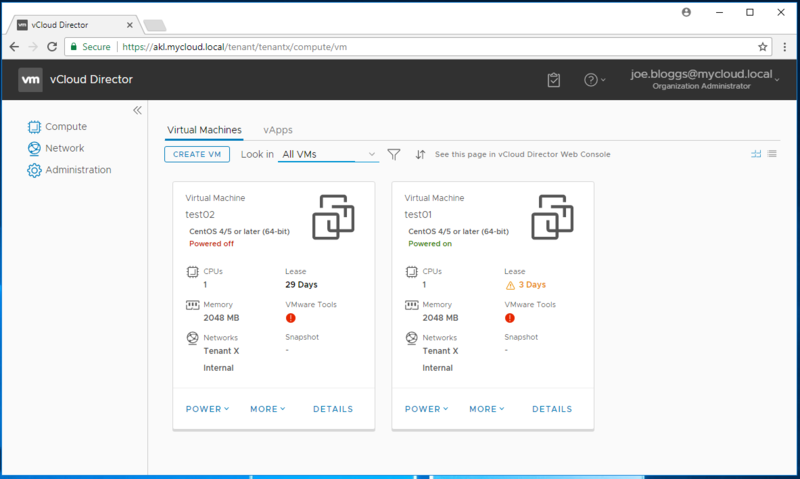 Since vCloud Director 8.10 VMware have allowed VMs to be created which have multiple disks using different storage policies. This can be very useful – for example, a database VM might have it’s database on fast storage but another disk containing backups or logs on slower/cheaper disk. When trying to find out what storage is in use for a VM though this can create issues, the PowerCLI Get-CIVM cmdlet (and the Get-CIView cmdlet used to get extra information) aren’t able to properly report storage for VMs that consume multiple storage policies. This in turn can create problems for Service Providers when they need to report on overall VM disk usage divided by storage policy used. 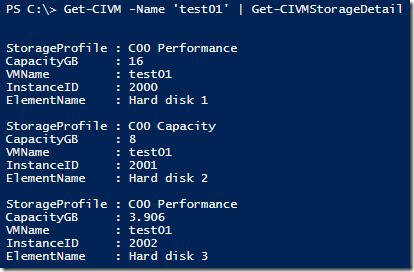 After a lot of mucking around trying to find an easy way to discover the information, I ‘gave up’ and wrote a PowerShell module which accesses the vCD API directly to get the VM storage information (including storage tiers in use by each disk). The module isn’t overly efficient since it queries the storage profile reference for every disk on every VM (and so will result in a lot of calls if run for a large number of VMs), but otherwise works fine. The module takes VM objects or a VM name as input and returns details on each disk attached to the VM including which storage profile they use. Save the script (e.g. as ‘Get-CIVMStorageProfile.psm1’) and then use ‘Import-Module .\Get-CIVMStorageProfile.psm1’ to import the function. 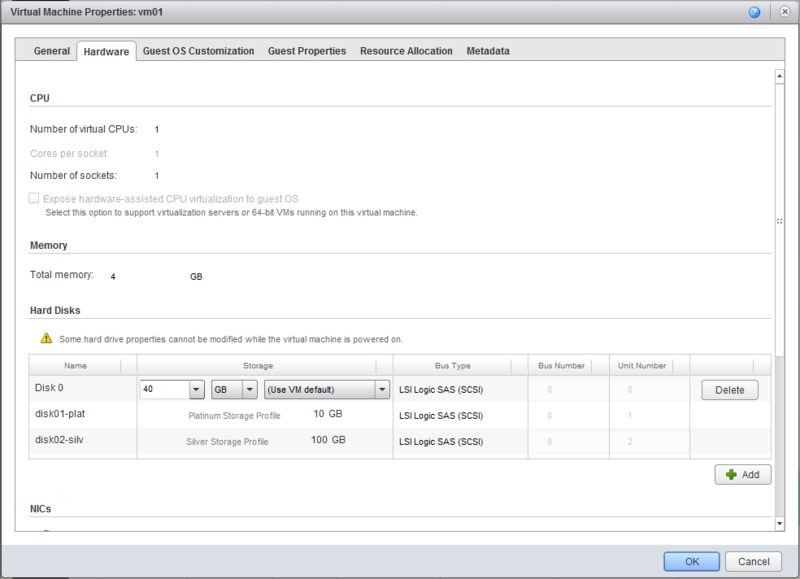 Gets detailed storage information from a vCloud VM. 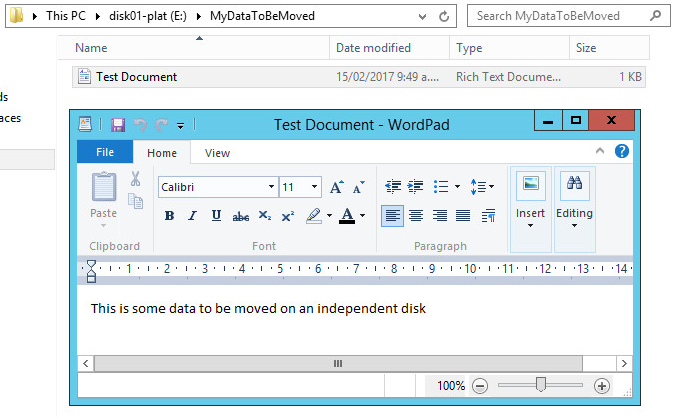 disk which is useful when VMs consume storage from multiple policies. The VM object (from Get-CIVM) to report storage for. Write-Host -ForegroundColor Red "Error: Could not find a VM with the name $CIVM." Write-Host -ForegroundColor Red "Error attempting to get VM details from API:"
Write-Host -ForegroundColor Red "Status Code: $($_.Exception.Response.StatusCode.value__)"
Write-Host -ForegroundColor Red "Status Description: $($_.Exception.Response.StatusDescription)"
Write-Host -ForegroundColor Red "Error attempting to get Storage Profile Name:"
Hope this is useful to some of you and as always, appreciate any comments/feedback. I’d also love to know if there’s an easier way of generating this information. One of the issues that vCloud Director user can run into is user authentication when using the PowerCLI and vcd-cli tools to manage their cloud deployments. For ‘Local’ user accounts defined in the vCloud Director portal this isn’t an issue as username/password are stored in the vCD database and can be directly authenticated. However, many customers want to federate their vCloud users with an external directory service (often Microsoft AD FS or other similar service). Typically this is done so that security groups in the external directory can be used to control access levels, and so that additional authentication mechanisms like 2-Factor Authentication (2FA) can be applied to accounts. If you attempt to use CLI tools like vcd-cli or PowerCLI to authenticate with a federated user account you will get a ‘Login Failed’ or ‘Unauthorized’ failure and won’t be able to connect to the service. 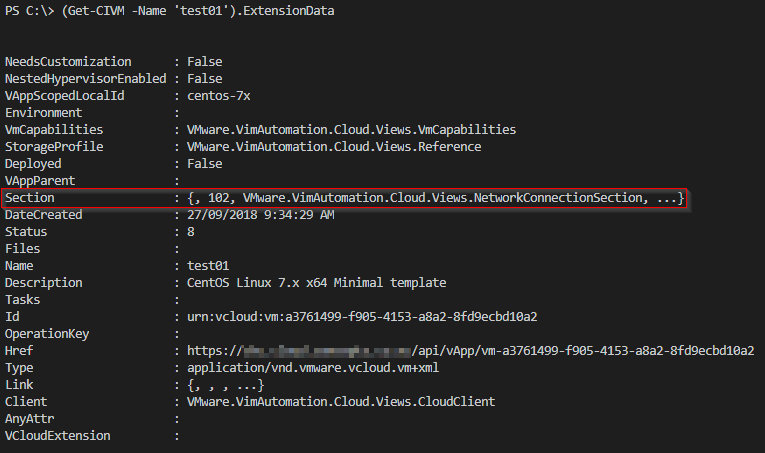 Fortunately, both vcd-cli and PowerCLI allow you to use an existing browser vCloud session ID to connect to the vCD API. To use this you connect to your vCloud portal in a web browser and then then use your browser’s tools to find the session ID for your connection. Once you have the session ID you can create a PowerCLI or vcd-cli session using that token. It can sometimes be easier to use a browser plugin or extension to help find the session ID, ones which show session cookies and/or HTTP headers work best, but even without these it is possible. You will then be connected as the same user from your browser session and able to run all the PowerCLI or vcd-cli commands with that user account. Which should return the session ID from an instance of Chrome, but in my initial testing this was not returning any output at all. Reading through the vcd-cli sources it appears that this option relies on a Python extension ‘browsercookie’ which can be installed using pip install --user browsercookie. Browsercookie has a dependency on the ‘pycrypto’ module which must also be installed. However, even with both pycrypto and browsercookie installed I couldn’t get this option to work. And this can be used directly to login automatically once a Chrome session exists using the --use-browser-session switch. Also note that you can obtain the session ID like this from vcd-cli and use it to authenticate a PowerCLI session with no issues at all. Since vCloud Director v9 was released last week (and previously as part of the closed beta), one of the new features I’m most excited about is support for multi-site deployments. 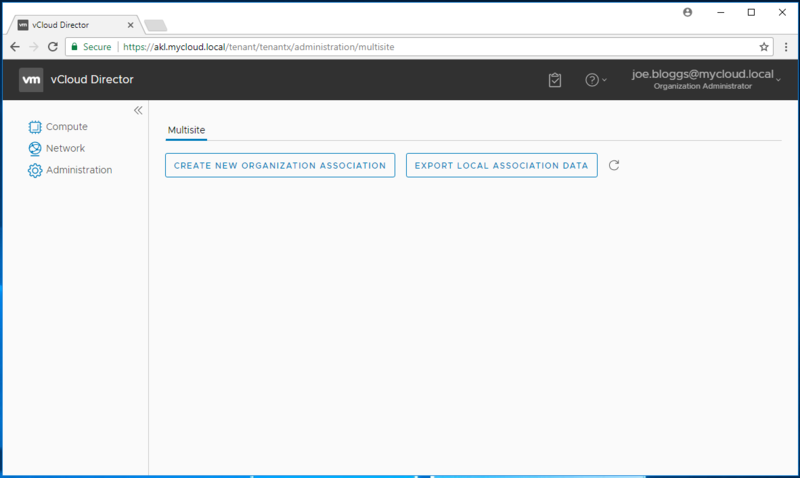 This allows vCloud Director environments for the first time to properly span federated sites (e.g. a tenant who has resources in multiple datacenter locations for resiliency/redundancy can now manage these in the same place). 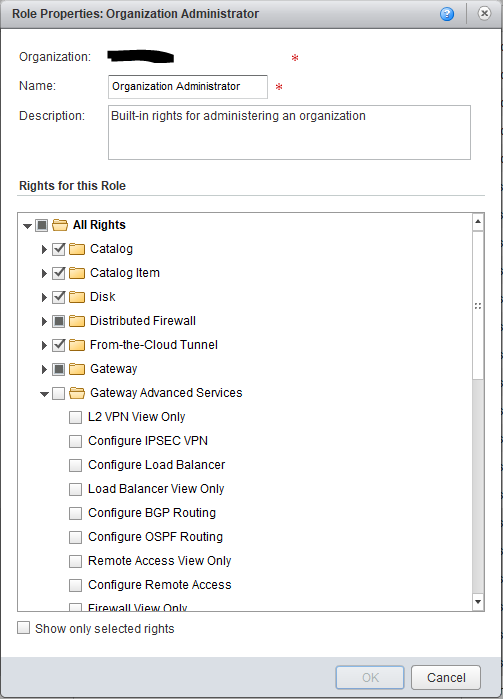 1) The service provider has to configure federation between their vCloud Director instances. 2) The tenant has to associate each of their Organizations in each vCloud Director instance. This post will attempt to explain and show both processes, and there’s even a bonus of a PowerShell script I’ve written to help other service providers configure their site pairings. To help demonstrate the processes involved, I’ve built a test lab environment consisting of 4 separate vCloud Director instances (‘Auckland’, ‘Wellington’, ‘Christchurch’ and ‘Dunedin’ sites). Each of these has it’s own vCloud Director, vCenter, NSX and ESXi hosts. 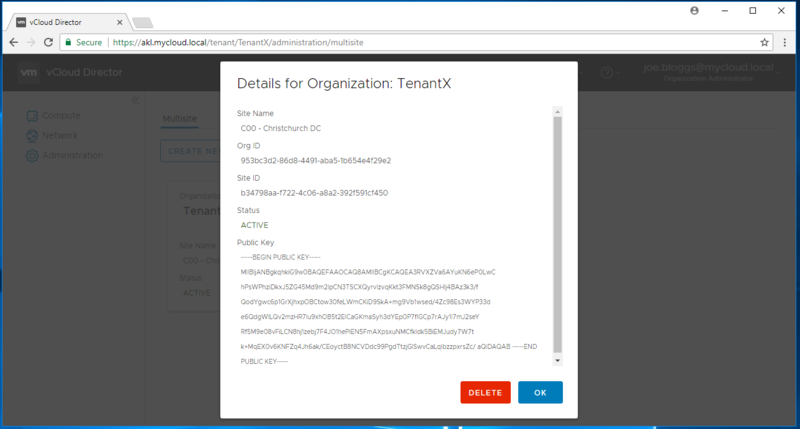 I’ve also created a tenant organization (‘Tenant X’) in all 4 instances and created and assigned a VDC to Tenant X in each location. 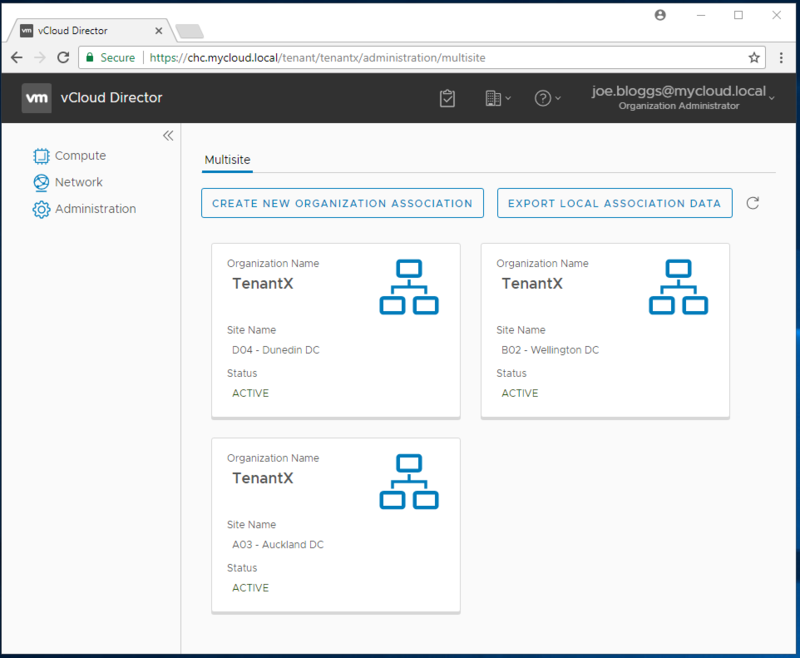 Finally, I’ve federated Tenant X’s vCloud users with a directory service (Microsoft AD FS in this case) so that the same identity provider is available to all 4 vCloud instances. If you’re not a service provider and just need to configure Organization pairing you’re probably safe to skip this section and proceed straight to the 2nd part of this post. 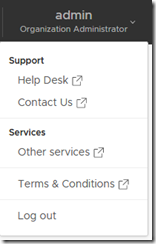 – Check (and configure if necessary) the vCloud site name in each location. Note by default in the initial vCloud Director 9 release this is simply a GUID string so you’ll probably want to change it to something more meaningful. In a scenario with only 2 sites you need to perform this process twice (once in each direction), but for our example with 4 sites we need to do this a total of 12 times to pair every site with every other site. Being a bit of a pain to do manually against the REST API interface I ran true to form and wrote a PowerShell module to simplify the process of both administering the site names and also pairing sites together. The module is available on my github repository at https://github.com/jondwaite/vCDSitePair. The script uses my Invoke-vCloud module, so you’ll need that installed for it to run. Get-vCloudSiteName Allows a service provider to check/confirm the ‘Site Name’ assigned to a vCloud Director instance. Set-vCloudSiteName Allows a service provider to set/update the ‘Site Name’ assigned to a vCloud Director instance. 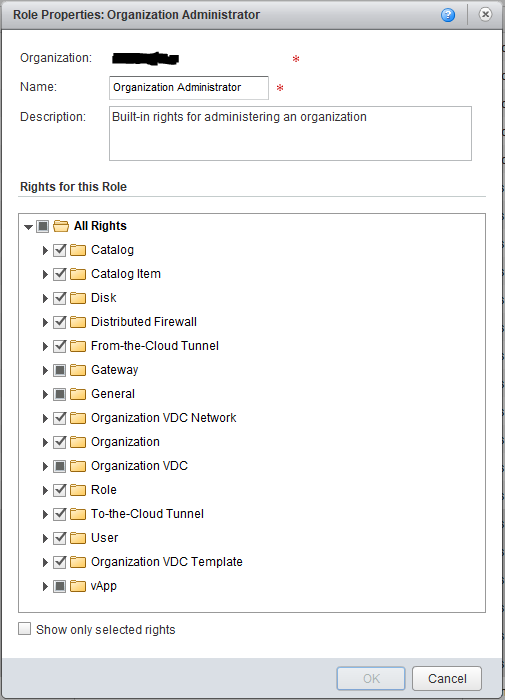 Get-vCloudSiteAssociations Shows the existing associations (if any) from a vCloud Director instance. Invoke-vCDPairSites Performs the 2-way exchange of localAssociationData documents to pair two vCloud Director instances. (I’ve cut out the certificate dumps for brevity). So now that our Auckland and Christchurch sites are paired we can move on with associating the Organization (‘Tenant X’) between these sites. I’ve also been through and associated all of the other sites to each other, so by this stage ‘Auckland’ is associated to ‘Wellington’,’Christchurch’ and ‘Dunedin’ etc. All in all, a little bit of a convoluted process, but at least it should only need to be done once and can then be left alone. Very excited to see what VMware do with this functionality in future – can definitely see a time when all of an Organization’s VMs are displayed / summarised in a single view regardless of which vCloud instance supports them. 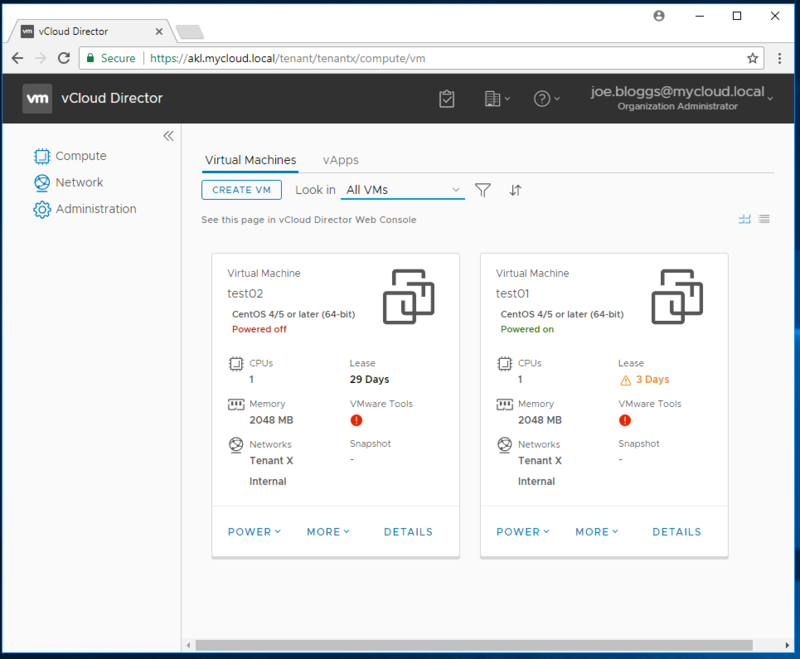 I have several more thoughts generally on vCloud Director v9 which I’ll put into a separate post when I have time, but wanted to get this published for anyone else playing around with the new multi-site features. As always, comments and feedback appreciated. 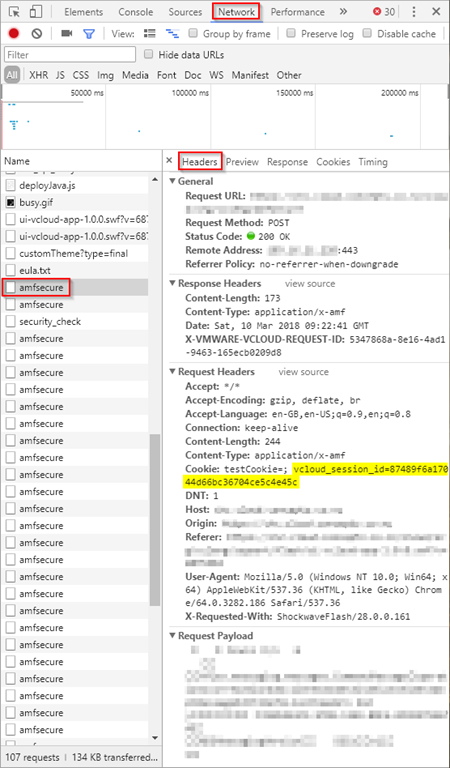 Several of the posts on here and many of the internal PowerShell projects I use at work require direct interaction with the vCloud Director REST API. Usually this is because features exposed in the API aren’t yet directly implemented as PowerCLI cmdlets. 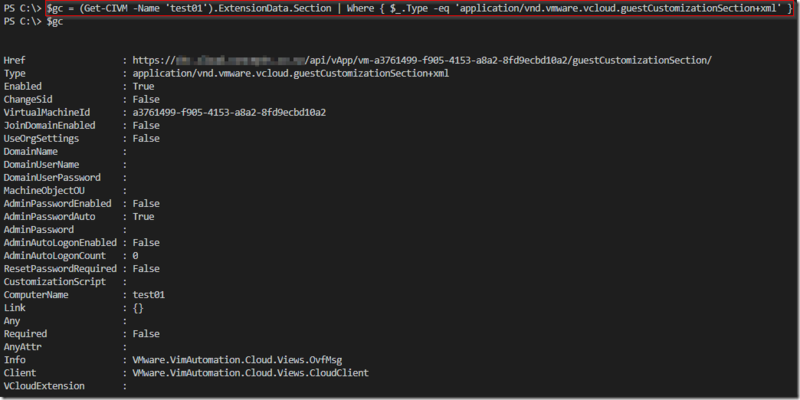 A good example would be the modules I wrote to allow manipulation of independent disks with vCD VMs here: Independent Disks in vCloud via PowerCLI. As I wrote more and more scripts that require interaction with the vCD API I started to develop a generic function to allow easier interaction with it. I’m intending in future to use this as the basis for future scripts requiring this functionality which should be useful in keeping the script size smaller and provide an easier method of interacting with the API. PowerShell has a built-in ‘Invoke-RestMethod’ call which submits a REST request and gathers any responses, but there are a variety of additional parameters required in a typical vCD API call which this method doesn’t know about and which need to be supplied with each call. Wrapping Invoke-RestMethod in a function allows us to much more easily consume the API and makes handling calls which return a long-running task much easier to handle by giving the option to return immediately or to wait for the complete interaction to complete before returning. URI The URI (Uniform Resource Identifier) for the API call (typically of the form https://my.cloud.com/api/requestpath). Method This is simply which HTML method we are invoking from the common HTML verbs (‘GET’,’PUT’,’POST’,’DELETE’) – the fifth verb (‘PATCH’) doesn’t appear to be used much (if at all) in the vCloud API, but could be specified if required. We can also assume a sensible/safe default value of ‘GET’ since that will only read from the API and not change anything. 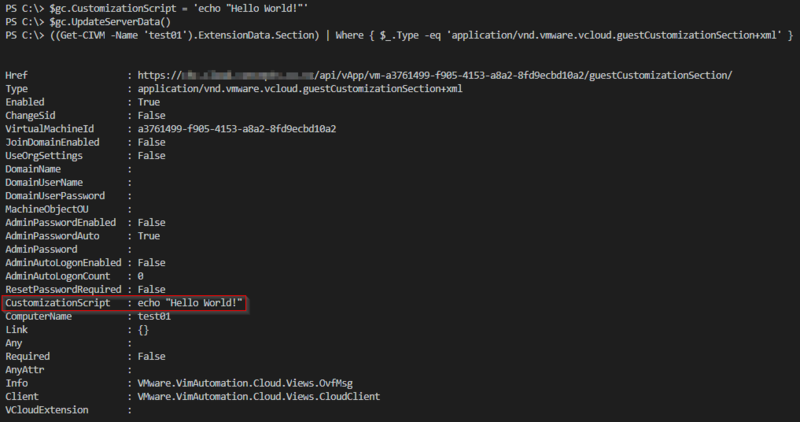 Authorization Provided as an HTML Header using the x-vcloud-authorization tag and a previously existing session ID. We could supply the session ID as part of the call, but it’s usually much more convenient to attempt to match the request URI against PowerShell’s existing global view of connected vCD API endpoints and use the existing session ID available from here. Accept Provided as part of the HTML header, this tag specifies the type of information we are prepared to accept back from the API, this will usually be set to ‘application/*+xml’ but we also need to specify which version of the API we wish to use – in vCloud Director 8.20 this is version 27.0 so the complete Accept token will be ‘application/*+xml;version=27.0’. We can provide a sensible default value for this in our module so that if it is ommitted we still get a sensible version specification. ContentType When we are sending data to the API with a PUT or POST request, we need to specify the type of document we are sending using the ContentType header, for GET requests this isn’t required. Body When sending data to the API, this will be the (usually XML formatted) document body. Timeout Some API operations can take a while to complete, specifying a timeout value allows our script to carry on or raise an error if an API call is taking an excessively long time. In addition to these, I’ve also included a flag ‘WaitforTask’ which can either be true or false. If set to ‘true’ and if the result of the API call is a ‘Task’ object reference then the script will monitor the task and wait until it has completed (or timeout exceeded) and then return the task status to our script. This can be useful for operations that can take considerable time when it doesn’t make sense for your script to continue until the previous action has been completed – e.g. cloning a new vApp and then modifying it’s network settings. I was keen to explore using Microsoft’s PowerShell Gallery as a mechanism to distribute modules, this should make it easier to be able to use these modules and functions wherever needed by simply importing the module as required. The process to make a module available in the gallery is reasonably straightforward and documented on the site, but basically once you’ve signed up and got an API key you simply call Publish-Module and provide the path to your module code and manifest including your API key as an identifier. 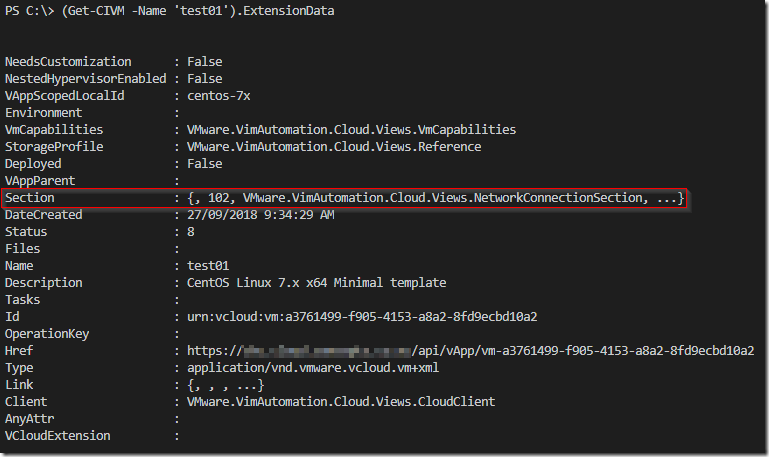 You will either need to have an existing PowerCLI vCloud session (Connect-CIServer), or have an x-vcloud-authorization token for a valid/authenticated session which you can pass to Invoke-vCloud using the -vCloudToken parameter. A mandatory parameter which provides the API URI to be accessed. An optional parameter which provides the ContentType of any submitted data. DELETE). Defaults to 'GET' if not specified. An optional parameter to specify the API version to be used for the call. (usually for a PUT or POST action). call to complete. Defaults to 40 seconds if not specified. 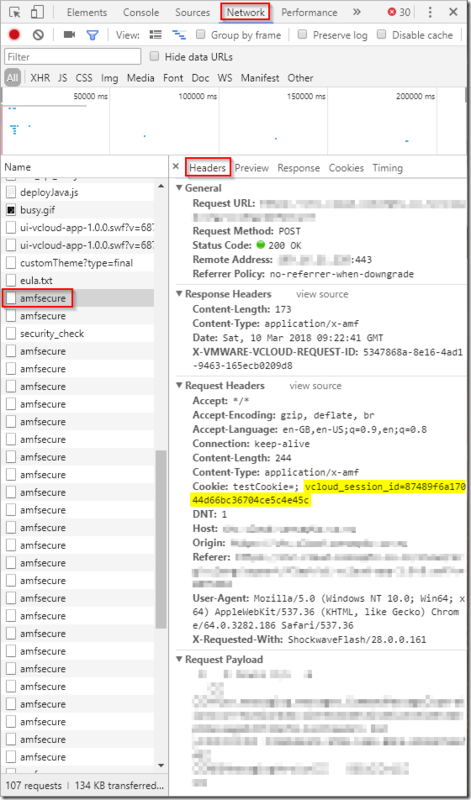 supplied is copied to the 'x-vcloud-authorization' header value in API calls. I have some new scripts in development against some of the new features in the recently announced vCloud Director v9 which I’m intending to use this module for and will post as soon as v9 is released. As always I welcome any comments and suggestions for improving this module. One of the key changes in vCloud Director 8.20 and 8.20.1 from 8.10 is the Advanced Networking for Edge Gateways, this allows customer control of several advanced networking features of the Edge Gateways which previously could not be made available to tenant administrators. 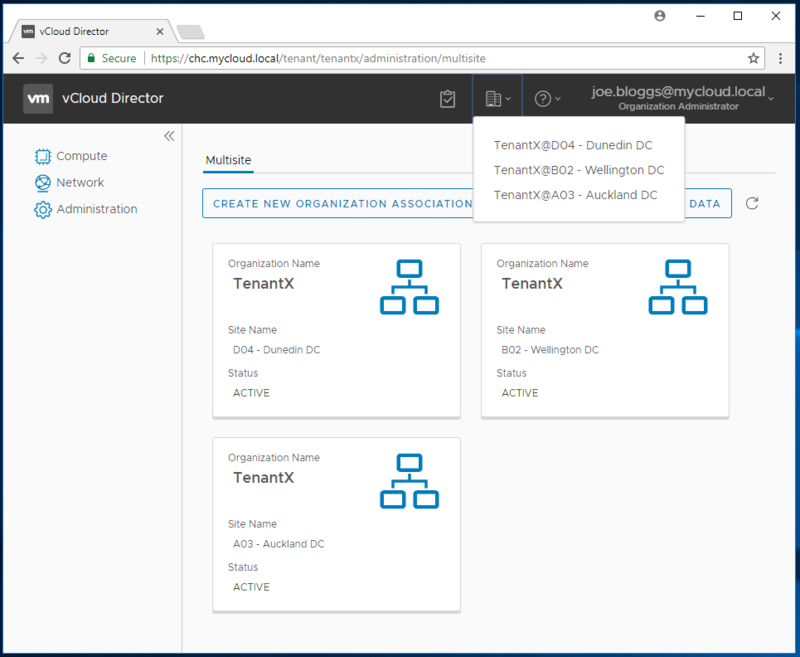 vCloud Director 8.20 and later also change the Roles to be per-tenant organisation (rather than globally shared between all tenants). 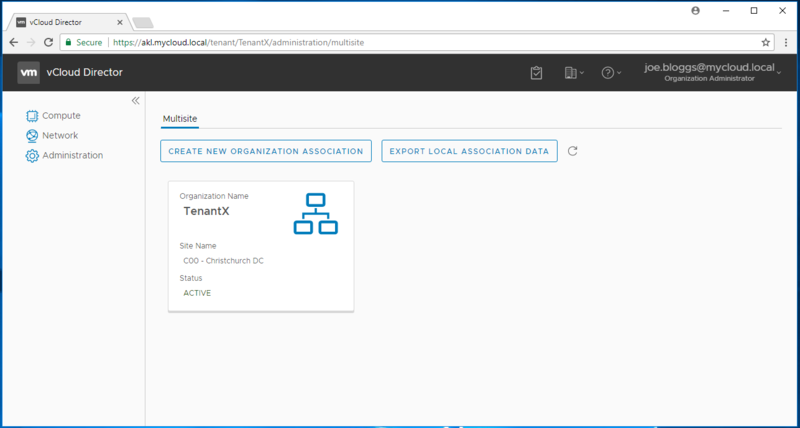 However, in order for tenant administrators to be able to take advantage of the new features, the new Edge Gateway roles need to be added to their organisation. The only way currently to achieve this is by the vCloud REST API and must be performed separately for each organisation in the vCloud infrastructure. Since manually modifying the OrgRights XML is time-consuming and a bit prone to error, I set about writing a PowerCLI script to make the change automatically for a given organisation. Note that this change does not alter the defined roles for an organisation, it simply adds the new Edge Gateway permissions as available entities which can then be selectively added to roles. The script is included below, as always I welcome any thoughts/comments/feedback. # Script to add new OrgRights options for administering advanced Edge Gateway to a vCloud Director organisation. # this script has been run against their org. # NOTE: You must be connected to the vCloud API (Connect-CIServer) with a System administrative user prior to running the script for this to work. Write-Host "Not connected to this vCloud endpoint, use 'Connect-CIServer' before running this script." Write-Host "Couldn't match organization with name $OrgToUpdate, exiting." $rightsuri = 'https://' + $APIendpoint + "/api/admin/org/" + $org.Id.Substring($org.Id.LastIndexOf(':')+1) + "/rights"
Yesterday I wrote about the PowerShell module I’ve written (CIDisk.psm1) to allow manipulation of independent disks in a vCloud environment. This post shows some usage options and details some of the caveats to be aware of when using disks in this manner. There are no context actions for these disks though and we can’t attach/detach them to VMs in the vCloud interface. Note again that no manipulation options are available in the vCloud UI, but at least it’s obvious that independent disks have been attached to VM01. Hopefully this gives a better idea of how CIDisk can be used to manage independent disks in a vCloud environment, it would be nice if VMware included the management functions in the UI, but for now at least you can use PowerShell to easily achieve the same results without having to write against the API directly. As always, any comments / feedback greatly appreciated. The customer in question is a tenant on our cloud platform and has built a VM to be their offline root Certificate Authority (CA). In line with their security practice, this VM has no network connectivity and is usually powered-off in their environment unless specifically required to issue or renew certificates. They asked if there was an easy way to transfer certificate files issued by this VM to other servers in their infrastructure. In their (old) vSphere environment they would simply attach a new temporary virtual disk to the VM, copy the certificate files over and then attach the disk to the destination VM. Surely there had to be some similar functionality in vCloud Director? 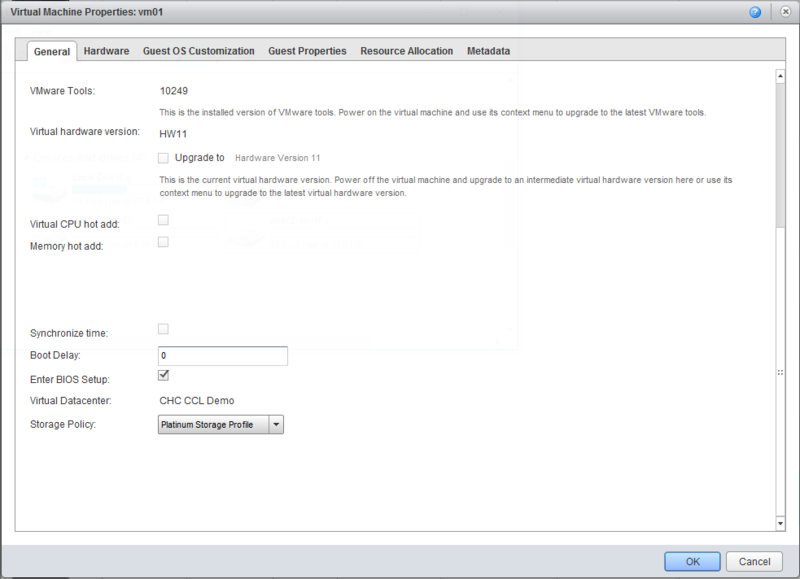 By default disks in vCloud Director are assigned (permanently) to a VM, they can’t be moved to different VMs. (That’s the bad news). 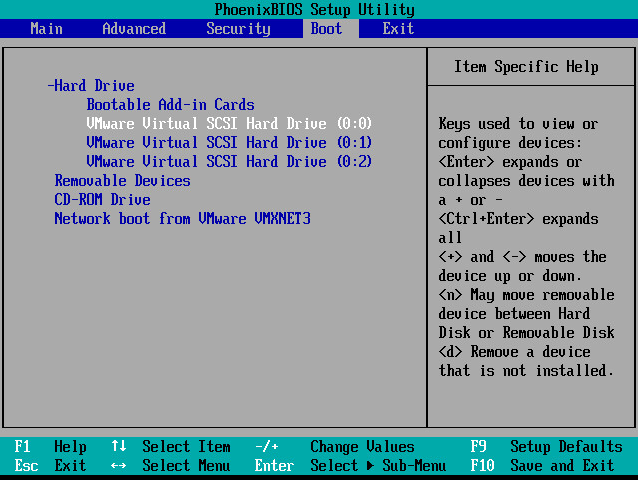 The good news is that vCD supports ‘independent disks’ which can be moved between VMs. The bad news is that this is an API-only operation (nothing in the web UI allows creation or manipulation of Independent disks, although you can see them if they exist). The worst news is that VMware PowerCLI even in the latest 6.5R1 version doesn’t have any cmdlets to manipulate independent disks attached to vCloud VMs either. So while I could have hacked something together to run directly against the vCloud Director REST API for this customer, I figured it would be better to have some reusable PowerShell cmdlets for this. So I set about writing some and I’m pleased to announce the first release of ‘CIDisk’, a collection of PowerShell cmdlets to manipulate independent disks in vCloud Director environments. I’ll do a followup post detailing some more advanced options and scenarios in the next day or two. Edit – Followup post is now available here. As always I appreciate any/all feedback and hope someone else finds these useful.